Today, I’m back again to tackle another portion of Philip McGoo’s response to my post titled “Unconditional Election: The John Piper Fallacy in Romans 9” that I posted a few days ago. Before I get started, let me state some rules about posting that maybe I’ve not made known at the site. I will, however, create an official rules post for those who desire to know what I will and will not allow on the site for comments. I will not allow posts on the site such as snide remarks. I recently received one of those about a day or so ago...and it will not be tolerated at the site. I don’t want things like, “you Arminians argue works-salvation,” etc. Instead, I want comments regarding the content of the post itself. If you are visiting the site to simply throw out insults, it’s probably better not to comment. Since Calvinists often believe in the sovereignty of God to elect some and not others (I believe in God’s sovereignty, just not the way they do), then know that I will bear sovereignty over my site and I will not post comments containing snide, rude remarks. If you’re genuinely seeking dialogue, like Philip, I am more than happy to answer questions you have. If you’re seeking to be angry and assert that “John Piper is cool...you haven’t written the books he has, you haven’t sold as many books as he has, you don’t pastor a church like he does,” etc., I simply will not post such comments. So before you waste a few minutes of your time, let me tell you that your comments will go unnoticed. No one will read them, and I will not respond to them. It will be as though you never wrote them at all. Since I bear sovereignty over The Center for Theological Studies, I will select some comments to post and not others. 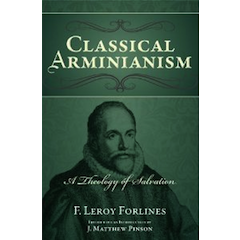 How’s that “Calvinism-in-practice” for a Reformed Arminian??? Next, Philip asks me to consider the consequences of my view. First off, let me applaud Philip for holding to “logical consistency.” There is much talk (at least in Baptist life today) that one does not have to hold to logically consistent systems. Many theologians on the question of theological systems have lost what I call “the principle of the excluded middle”: that is, when two mutually-exclusive systems are on display, there can be no middle ground. And yet, it seems that “middle-ground,” inconsistent theologies are the talk of the day. Do you know why this is so? Because we have lost the meaning of logical consistency. When one simply assumes that logical consistency is man-made, he will create his own theology; but when one views consistency as describing the nature and character of the God he or she talks about, then their theology will come to reflect the nature and character of the God of Scripture. “This is my opinion concerning the free will of man: In his primitive condition as he came out of the hands of his creator, man was endowed with such a portion of knowledge, holiness and power, as enabled him to understand, esteem, consider, will, and to perform the true good, according to the commandment delivered to him. Yet none of these acts could he do, except through the assistance of Divine Grace. But in his lapsed and sinful state, man is not capable, of and by himself, either to think, to will, or to do that which is really good; but it is necessary for him to be regenerated and renewed in his intellect, affections or will, and in all his powers, by God in Christ through the Holy Spirit, that he may be qualified rightly to understand, esteem, consider, will, and perform whatever is truly good” (James Arminius, VII, “The Free Will of Man.” Quoted by John Wagner, Arminius Speaks: Essential Writings on Predestination, Free Will, and the Nature of God.” Eugene: Wipf and Stock, 2011, page 68). From the above underline words, one can see that Arminius held to total depravity: man can do nothing on his own; he must have the Holy Spirit give him grace before he can do anything that is good and God-glorifying. Arminius went on to say, “For without these gracious gifts [faith, hope, charity, etc. ], man is not sufficient to think, will, or do anything that is good” (James Arminius, VIII. “The Grace of God,” quoted by John Wagner, Arminius Speaks, page 68). “From this statement it will clearly appear, that I by no means do injustice to grace, by attributing, as it is reported of me, too much to man’s free will. For the whole controversy reduces itself to the solution of this question, ‘Is the grace of God a certain irresistible force?’ That is, the controversy does not relate to those actions or operations which may be ascribed to grace (for I acknowledge and inculcate as many of these actions or operations as any man ever did), but it relates solely to the mode of operation, whether it be irresistible or not. 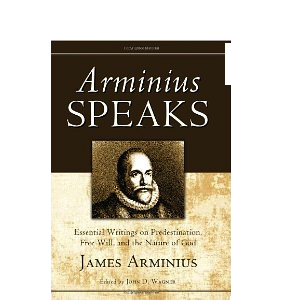 With respect to which, I believe, according to the scriptures, that many persons resist the Holy Spirit and reject the grace that is offered” (James Arminius, quoted by John Wagner, Arminius Speaks, page 69). Arminius does not neglect grace in his theology; rather, he argues that grace, while prevenient (going before faith), does not irresistibly make someone receive the gospel and trust Christ for salvation. I will respond to more of Philip’s quote above in coming days. God bless.